Donald J Horowitz: And when you determined, and I mean by you, I don’t mean you, you personally but when it was determined to cut down on the number of people who were going to be prosecuted which you discussed earlier, what happened to the 100 or so people that you are not going to prosecute? Did they stay here? Were they sent somewhere else? What? Well, they fell into different categories, and the Prosecutor, I’m sure, would be only too happy to give you more information about those. But basically there were some against whom it was felt that the process of continued tracking was unnecessary. There were others whom the, the tracking was continued and the files were handed over to the Rwandan government for them to take action. So there were different categories according to their level of seniority. The Prosecutor I’m sure will be only too happy to open the doors to tell you all about that. DJH: Were there some who – you already had custody of and then determined you wouldn’t prosecute here for reasons of whatever? DJH: And, and then you transferred them somewhere else. Yes. This is again a matter for the Prosecutor to talk about, because I’m not privy to the process by which the Prosecutor came to that decision. DJH: Yeah, I’m not asking why but I’m asking what happened to them. All right, there were, the Prosecutor announced on several occasions, there were referral cases. There were some who were going, he was going to refer to other states who had expressed a willingness to prosecute those cases. And then there were others who the Rwandan government had expressed a, a willingness to prosecute. In fact, the Rwandan government would have been happy to prosecute them all. But the-, there were some who the Prosecutor identified as being suitable for referral to Rwanda. Mr. Munyakazi was the first live individual whom we had in our detention facility to receive that honor of an application to refer to Rwanda and the Prosecutor ch-, chose also some fugitives as well, fugitives from justice for, for referral of the indictments to Rwanda. There were then referrals to other countries. There, there was a referral to Belgium, a referral to Norway. The same person after that referral was rejected was subject of an attempt to refer to Holland; that also was rejected by the Dutch and he is back here now. So in, in essence part of the completion strategy was to refer cases the Prosecutor felt were suitable to other jurisdictions, national jurisdictions. DJH: Mm-hmm. And those people, for example, th-, those who, few or however many that were sent to Rwanda would presumably be detained in the kinds of facilities you described the Rwandans have, as contrasted with the detention facilities here. No, as a result of the efforts of the Prosecutor and the Registrar, a model prison facility was developed for receiving referral cases from here and with funding from the international donors, the international standard prison was, has been built. DJH: Okay, in, in Kigali presumably, in or near Kigali. DJH: Yeah, near Kigali. All right, and have any of those been tried by the Rwandan courts? None of the referrals to Rwanda have taken place. The judges of – there were three attempts by the Prosecutor to refer and all – well, all three were rejected by the trials chamber, trial chambers for different reasons. 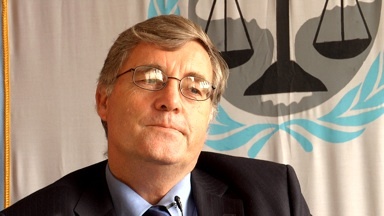 And the appeals chamber has now just yesterday – no, no, just end of last week – come to a decision supporting the trial chambers’ finding that referral to Rwanda was not going to take place because there was lack of certainty of a fair trial, in effect. The prison conditions, prison – there were cert-, certain aspects of the penal law were also an issue; uncertainty about whether it was possible that people referred to Rwanda might have to serve imprisonment for life if they were found guilty, in isolation. That was one area. It was a bit – it was, was ambiguity in the Rwandan law. But it, under one reading, it would be possible for people referred to end their days in, and outliving the whole of their life in isolation, and that was felt not to be commensurate with the international standards. The principal concern of all three trial chambers dealing with these referrals was the independence of the judiciary. The appeals chamber to some extent qualified the findings on that and, or in the, in the present finding, but supported the trial chamber in respect of the, running the defense cases. How could you – what happens is when we run defense cases here, we bring witnesses. Whoever the defendant wants as a witness we have to bring. Or we get them to testify via video link, if they’re too frightened to come to Africa. Most of the Rwandan ex-génocidaires or Rwandan Hutus are, are in the diaspora throughout the globe. A lot of them are wanted by the Rwandan government for crimes. And so we tend to bring them here under anonymity, under pseudonyms, under secrecy. And we let them give evidence under pseudonyms and then we send them away. It’s a very real issue. Well, how could they, emotionally? And it’s just a very difficult situation. So the question is well, can they all give evidence by video link? Well, then you have the situation where all the prosecution witnesses giving evidence in person and all the defense witnesses giving evidence on screen, so it’s an obvious disparity and that was felt to be unfair by, by – and the appeals chamber supported that position. DJH: So . . .
More than you ever wanted to know about referral. DJH: No, no. Not at all because it, it also addresses another question which – and, and we can wander a bit.